The festival is headquartered at TIFF Bell Lightbox, which opened in 2010. For the food festival in Italy, see Asti's Festival of Festivals. The Toronto International Film Festival (TIFF, stylized as tiff. ; French: Festival international du film de Toronto) is one of the largest publicly attended film festivals in the world, attracting over 480,000 people annually. Over the last 40 years, TIFF has grown to become a year-round destination for film culture operating out of the TIFF Bell Lightbox, a dynamic centre for film culture that offers film lovers a world-class cinema experience including new releases, live one-of-a-kind film events and an interactive gallery. Founded in 1976, TIFF is now one of the most prestigious events of its kind in the world. In 1998, Variety magazine acknowledged that TIFF "is second only to Cannes in terms of high-profile pics, stars and market activity." In 2007, TIME noted that TIFF had "grown from its place as the most influential fall film festival to the most influential film festival, period." This is partially the result of TIFF's ability and reputation for generating "Oscar buzz". The Toronto International Festival’s Grolsch People’s Choice Award — which is based on popular vote by Festival filmgoers — has emerged as a beacon of awards season success. Past recipients of this audience accolade include Room, The Imitation Game, 12 Years a Slave, The King's Speech, Slumdog Millionaire, Silver Linings Playbook, Argo, and Dallas Buyers Club. The Toronto International Film Festival began as the Toronto Festival of Festivals, collecting the best films from other film festivals around the world and showing them to eager audiences in Toronto. Founded by Bill Marshall, Dusty Cohl and Henk Van der Kolk, the inaugural event took place from October 18 through 24, 1976. That first year, 35,000 filmgoers watched 127 films from 30 countries presented in ten programmes. Piers Handling has been the festival's director and CEO since 1994, while Noah Cowan became co-director of TIFF in 2004. In late 2007, Cowan became the artistic director of TIFF Bell Lightbox, while long-time programmer Cameron Bailey succeeded as co-director; as of 2013, Bailey also holds the position of artistic director. TIFF was once centered on the Yorkville neighbourhood, but the Toronto Entertainment District later gained a greater level of prominence.TIFF is known for the celebrity buzz it brings to the area with international media setting up near its restaurants and stores for photos and interviews with the stars. In 2010, TIFF opened its permanent headquarters, TIFF Bell Lightbox, a year-round home for the appreciation of film in the heart of downtown Toronto. The Toronto International Film Festival, known originally as "The Festival of Festivals", was founded in 1976 at the Windsor Arms Hotel by Bill Marshall, Henk Van der Kolk and Dusty Cohl. Beginning as a collection of the best films from film festivals around the world, it had an inaugural attendance of 35,000. Ironically however, Hollywood studios withdrew their submissions from TIFF due to concerns that Toronto audiences would be too parochial for their products. In the years following, TIFF continued to concentrate on bringing the best films from around the world.Through consistent investment and promotion by its organizers and sponsors, the Toronto International Film Festival has also grown to become a vital component of Hollywood's marketing machine. Films such as American Beauty, Ray, Mr. Nobody, 127 Hours, Black Swan, The Five Obstructions, Singapore Sling, and I Am Love have premiered at TIFF. Jamie Foxx's portrayal of Ray Charles ultimately won him the Academy Award for Best Actor while Slumdog Millionaire went on to win eight Oscars at the 2009 Academy Awards. Precious, which won the 2009 TIFF People's Choice Award, went on to win two Oscars at the 82nd Academy Awards. The King's Speech, the winner of the 2010 TIFF People's Choice Award, won four Oscars at the 83rd Academy Awards, while Silver Linings Playbook, the winner of the 2012 TIFF People's Choice Award, went to win the Academy Award for Best Actress for Jennifer Lawrence. 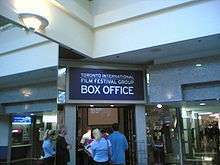 In 2007, the Festival Group began construction on TIFF Bell Lightbox, a new facility at the corner of King and John Streets in downtown Toronto on land donated by Ivan Reitman and family. The $181 million facility is named for founding sponsor Bell Canada, with additional support from the Government of Ontario and Government of Canada. In 2010, the organization opened a new headquarters at the intersection of King St and John St, in a facility called TIFF Bell Lightbox. The facility, designed by local firm, KPMB Architects, provides extensive year-round galleries, cinemas, archives and activities for cinephiles. The five-storey facility contains five cinemas, two gallery spaces, film archives and an extensive reference library, study spaces, film lab facility, and a research centre. There is also a gift shop, two restaurants, a lounge, a cafe, and a three-storey atrium. Cooperatively with Daniels Corporation, there is a 46-storey condominium atop, called the Festival Tower. The Film Reference Library (FRL) is a large Canadian film research collection. The library is a free resource for film lovers, filmmakers, students, scholars, and journalists, and is located on the fourth floor of the TIFF Bell Lightbox. An affiliate member of the International Federation of Film Archives (FIAF), the FRL promotes Canadian and global film scholarship by collecting, preserving, and providing access to a comprehensive collection of film prints, and film-related reference resources (including books, periodicals, scripts, research files, movies, press kits, and about 80 Special Collections). In 2016, the festival received a donation of 1,400 film prints, and launched a campaign to raise money for the preservation and storage of the films. Each year, TIFF also releases a list of the films selected by festival programmers as the ten best Canadian films of the year. The ten films selected are announced in December each year, and are screened at a smaller followup festival at the Lightbox the following January. Since 1984, every decade TIFF has also produced a Top 10 Canadian Films of All Time list. This list is produced from a wider poll of film industry professionals and academics throughout Canada, separately from the annual top ten list. TIFF lacks a jury and is non-competitive; regular awards handed out at other festivals for categories such as "Best Film" or "Best Actress" do not exist at the Toronto International Film Festival. The major prize, the People's Choice Award, is given to a feature-length film with the highest ratings as voted by the TIFF-going populace. The winner of this award has often later earned Academy Award nominations. The table below shows the Peoples Choice winners of past years. The color blue indicates films which were nominated for the Best Picture Oscar that same year; gold indicates those which won. TIFF also presents seven other awards for People's Choice Best Documentary, People's Choice Best Midnight Madness film, Best Canadian First Feature, Best Canadian Short Film, Best International Short Film, FIPRESCI's Special Presentation Winner and FIPRESCI's Discovery Section Winner. In 2015, the Festival introduced Platform, the juried programme that champions director’s cinema from around the world. In 2015, TIFF hosted 1,200 members of the press and print media outlets such as the Toronto Star, The Globe and Mail, The New York Times, The Times of India, Los Angeles Times, The Philadelphia Inquirer, Miami Herald, and the Toronto Sun have published a significant amount of festival coverage. Also, the major industry trade magazines Variety, The Hollywood Reporter and Screen International all produce daily editions during TIFF. TIFF reports also appear in weekly news magazines; American, Canadian and international entertainment shows; news services; and a wide range of film and celebrity blogs. ↑ "35th Anniversary Fact Sheet: TIFF Facts and Figures" (Press release). Toronto International Film Festival. September 27, 2010. Retrieved September 21, 2010. ↑ "Toronto 2013: Why the festival matters". BBC News. September 4, 2013. Retrieved September 5, 2013. ↑ Keegan, Rebecca Winters (August 2007). "Big-Screen Romance". TIME. Retrieved May 28, 2010. ↑ "Toronto Film Festival: Oscar Buzz Begins". CBS News. September 19, 2009. Retrieved August 25, 2011. ↑ "Cameron Bailey named artistic director of Toronto International Film Festival". National Post, March 14, 2012. ↑ Mudhar, Raju (August 25, 2010). "From mega clubs to mega culture in Entertainment District". Toronto Star. Retrieved September 7, 2010. ↑ Allen, Kate (August 24, 2011). "TIFF's great migration". Toronto Star. Retrieved August 25, 2011. ↑ Stavrou, Philip (September 2005). "Film Festival events return to their roots". CTVglobemedia. Retrieved September 19, 2014. ↑ Sterritt, David (April 2010). "Film Festivals - Then and Now". FIPRESCI. Retrieved June 8, 2010. ↑ "TIFF History". Toronto International Film Festival. Retrieved September 21, 2010. ↑ The Globe and Mail (2008–2011). "Director apologises for Rose McGowan's IRA comments". Belfast Telegraph. Phillip Crawley, Publisher. ↑ Israel set to launch in GTA, Canadian Jewish News, August 21, 2009. ↑ Posner, Michael (February 11, 2010). "TIFF focus on Tel Aviv draws protests". The Globe and Mail. Toronto. Retrieved August 17, 2012. ↑ Klein, Naomi (October 31, 2009). "We don't feel like celebrating with Israel this year". The Globe and Mail. Toronto. Retrieved August 17, 2012. ↑ News, CBC (August 29, 2009). "Canadian director protests TIFF Tel Aviv spotlight". Canadian Broadcasting Corporation. Retrieved September 16, 2012. ↑ "A conversation with organizers of the Toronto film festival protest". World Socialist Web Site. International Committee of the Fourth International. Retrieved April 16, 2013. ↑ "McGuinty government helps promote Toronto International Film Festival". Ontario Ministry of Tourism, Culture and Sport (Press release). September 7, 2007. Retrieved September 10, 2012. ↑ "Festival Announces Boundary-Pushing Visions Titles" (Press release). Toronto International Film Festival. August 16, 2011. Retrieved August 25, 2011. ↑ Ebert, Roger (September 2008). "Starting off the season". Chicago Sun-Times. Retrieved June 8, 2010. ↑ "TIFF unspools with celebrities eager to connect with fans". The Canadian Press. CTV. September 2009. Retrieved June 8, 2010. ↑ Rich, Joshua (January 2005). "Fest intentions". Entertainment Weekly. Retrieved June 8, 2010. ↑ Dixon, Guy (September 9, 2010). "Lightbox aims to draw filmmakers to its facilities - The Globe and Mail". The Globe and Mail. Toronto. ↑ Norman Wilner (September 9–16, 2010). "Let there be lightbox". NOW. Retrieved August 17, 2012. ↑ Germain, David (September 9, 2010). "No place like home: Toronto film fest opens new HQ". U-T San Diego News. The San Diego Union-Tribune, LLC. Retrieved September 16, 2012. ↑ "A look at the Stanley Kubrick Exhibition TIFF 2014". The Vancouver Sun. Canoe Sun Media. November 27, 2014. Retrieved August 3, 2015. ↑ "TIFF gains cach of 1,400 film prints". Toronto Star, November 16, 2016. Page E2. 1 2 "TIFF reveals Canada’s Top Ten Film Festival line-up". The Globe and Mail, December 8, 2015. ↑ Walmsley, Katie (September 2009). "Oprah flick 'Precious' wins top award at Toronto". CNN. Retrieved June 8, 2010. ↑ "‘The Imitation Game’ wins top prize at TIFF". The Globe and Mail, September 14, 2014. ↑ Knegt, Peter (September 2009). "'Precious' tops Toronto winners". IndieWire. Retrieved June 8, 2010.